Whether you’re revamping your office for a long overdue facelift, or you’re opening your first corporate headquarters, decorating your business shouldn’t be stressful and need not be expensive. You likely spend the majority of your week in your office, and you and your employees deserve to feel as comfortable as possible while also increasing productivity. If you have a business that regularly sees clients enter its doors, think about the message your current space conveys. Is it clean and organized? Does it appear worn and tired? First impressions are important, and your office may not be giving off the best one. Try these inexpensive office design ideas and overhaul your business decorations. The effects of a fresh coat of paint are underrated. This small investment could make a huge difference for both the exterior and interior of your business. Before you head to the local paint store, take some time to think about the color you should choose. If you’d like a clean, elegant look, stick with a neutral palette. If you’d like to make a splash, and your business would benefit from conveying an exciting, fun persona, a dash of color may be a better route to take. Color psychology is important in online selling for a reason. Take it into consideration for your office designs as well. You should definitely incorporate color into some aspect of your office interior. You do not want to make your office look like a Rainbow Brite project. However, incorporating color into office accessories will give life to an otherwise boring environment. It also conveys a more high-end, modern image to potential clients and employees. In addition, it can also brighten up the workplace environment by acting as a mood booster, if you choose the right accent colors. Make sure you add a splash of color to your office if you want it to look its best. This will do much more for your business than investing in a paper shredding service would. If you’re replacing furniture to make the office look and function better, you’ve got some options. New furniture can be tempting but brand new pieces can mean a hefty price tag and leasing furniture is a tricky temptress—it can end up costing you more than buying an entirely new set. 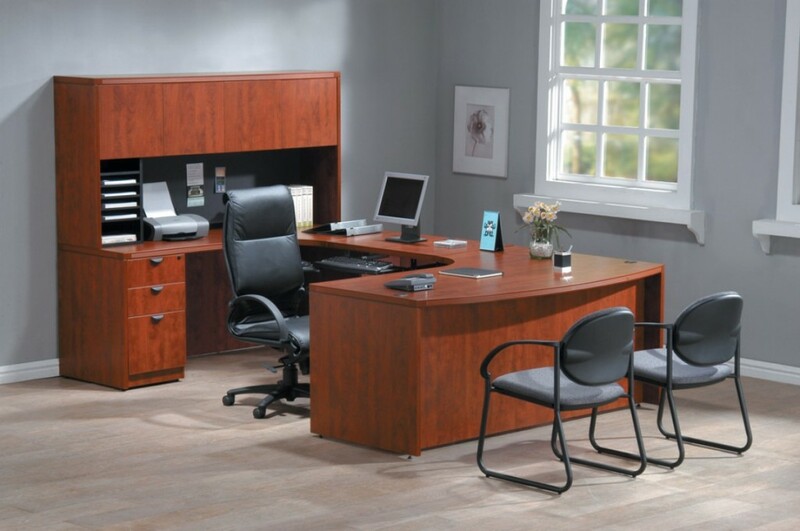 Even discount furniture stores run the bill up in a jiffy, especially if you need to outfit your entire office. Depending on your line of work, fancy new furniture may not do anything to improve productivity. You can find high-quality used furniture that will do the trick at a variety of places; from flea markets to business foreclosures, take the time to hunt and find a worthy investment. Another thing to consider: the less frills, the better. Clean and clear spaces lend themselves to productivity, so simple furniture is primed to serve you and your employees well. To save even more, accumulate a set through the gradual purchase of singular pieces with similar color schemes. Sometimes all your office needs for a facelift in style and practicality is a modern edge. Consider purchasing some unique modern products that will serve a useful purpose and look sleek. From wall art that will make any visiting clients stop and stare, to iPhone docks and utilitarian power cubes, transforming the office is easier than ever. With awesome speakers for media presentations and the occasional office party, decking your business out in practical items will go a long way for productivity and happy employees. If finding separate pieces makes it hard for you to keep the office decorated in a uniform manner, consider different design ideas for specific portions of the business. For example, keep bright colors and creative wall art adorning the area that houses your graphic designers, and paint blue walls for a calming atmosphere in your human resources department. It will make it easier for you to find select inexpensive pieces for each area. Nothing makes a workday feel longer than a dingy, dimly-lit office. Make sure your lighting is up to par and revamp the fixtures in your office for a brighter vibe. Clients who come into well-lit room will feel welcome, and employees who don’t have to squint to see their work will be saying thank you. Studies have shown that productivity increases in correlation to the amount of natural light available in a given area. Employees are more likely to work hard and stay longer in work spaces lit up by sunlight instead of the glare of harsh fluorescent lighting. Make the most of the natural light you do have, and find pleasing lighting sources for areas that don’t have windows. If you’re looking to invest in something beyond generic wall art, you can find great options for fixed prices at websites like 20×200 which will help you peruse an expansive collection of art prints based on a few personality and taste questions. If you’re looking for something even cheaper, put out an all-call to local art students and struggling artists, offering to display their art on your walls for sale. Clients who come in and out of your space may love a piece so much they feel inspired to buy it, meaning this system is beneficial for you and for your lending artist. Sometimes, we can tend to either go too minimalist or too cluttered in our office spaces. However, having proper accessories can help organized various areas of your office. Add accessories that reduce clutter and add a pleasant feel to the room. This can be done with paper weights, lamps, trophies, pen holders and other organizing accessories. They will surely clear up the place and add a nice personal touch, making a great office decorating idea. Redecorating your office can make a space look more inviting and impress any first-time clients. Keep your business free of clutter, eco-friendly, and practical. Think of product design and functionality when you are buying office decor and accessories. Make the place you spend most of your week one that’s pleasing on the eye and conducive to good work from your employees with these office decorating ideas and tips.